They talk about a wide range of subjects that have taken them both by surprise when they started their entrepreneurial lives. From the hardship, the dark times, the financial struggles and the big successes. 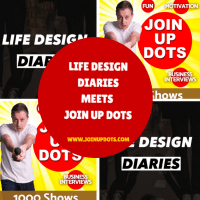 Ross does a great job on this show, and so it was a delight to be able to share the Life Design Diaries meets Join Up Dots in today’s episode. However to give you a flavour of this amazing guy, allow us to show you his backstory, so you will spend as much time as you can following Ross and his lovely wife Lucy’s adventures everyday. “In January 2018 we traded our beloved Manchester apartment, life, jobs, wardrobes and friends for 2 backpacks, 2 macs and 2 one way tickets out of the UK. Why? Not to find ourselves, not to run away from anything bad, & not be to be on the road living in hostels. More of a, why not! Neither of us are graduates, we both went into full time, very serious careers straight from school, so after getting married in June 2017, and falling head over heels whilst honeymooning in Bali, the idea of living and working from around the world started to develop. ​Our website and social accounts are both a chance for us to personally document, learn and share experiences from our journey. How even after a decade of publication Tim Ferris’s The Four Hour Work Week is still setting the inspirational spark in people across the world. David shares the moment when his life changed forever and he knew that he could never go back to working for someone again. Why it is so important to lose the ego and change the mindset when you want to start your own business. You can’t assume that you are the man right from the start. Why the 80/20 principle could potentially be the greatest gift that anyone can use when creating their own business, although most people ignore this amazing mathematical formula.